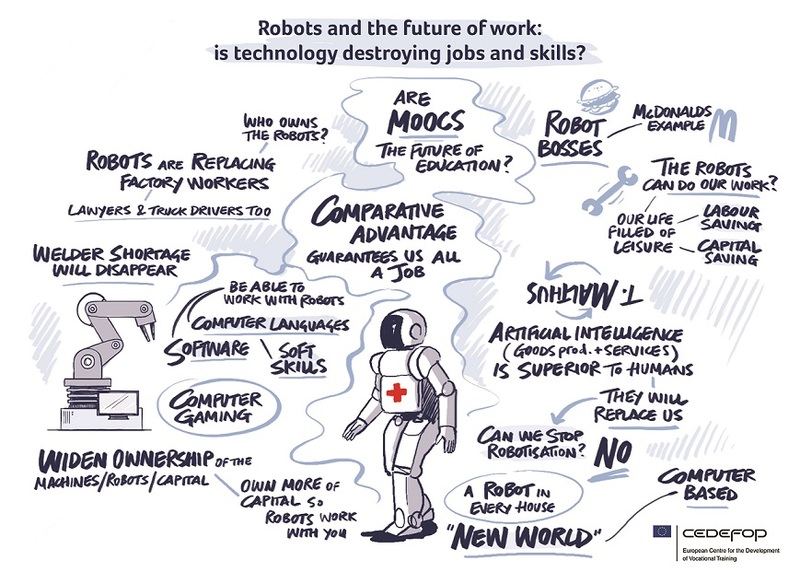 Cedefop’s ‘Digitalisation and the future of work’ project analyses the impact and drivers of automation, robotics, artificial intelligence and other digital technologies on employment and changing skill needs of jobs. It also examines the implications of new forms of digital labour, such as platform or crowd work, for individual’s skills development and skill mismatch. The insights of the project aim to inform policy regarding the future of vocational education and training. Cedefop’s European Skills and Jobs survey has revealed that about 43% of EU adult employees recently experienced new technologies at work, such as introduction of machines and ICT systems. About seven in ten EU workers require at least moderate digital skills to do their job. Rapid digitalisation and the spread of new technologies, such as the Internet of things, robotics and Artificial Intelligence are creating widespread disruption in EU labour markets, including a risk of job loss for some occupations due to automation. But technological progress is also offering opportunities for marked transformation in most jobs and business models, including an increasing reliance on independent or online platform labour, improvement in skills anticipation and matching capabilities and improved diagnostics with the assistance of Big data and algorithmic decision making. Unprecedented technological development will also impact skill needs and hence pose significant demands on both initial and continuing vocational training to enable reskilling and upskilling of individuals. As revealed by the Cedefop ESJ survey, one in five (21%) adult employees in Europe considers it very likely, and 27% moderately likely, that their skills will be outdated in the medium-term. the risk of automation across EU economies, sectors and occupations to understand who is at most risk of job polarisation and substitution by machines; Our report on Automation risk in the EU labour market is now available. strengthening capacity among EU countries in implementing technological skill foresight methods. The insights of the project feed into Cedefop’s ongoing reflections on the changing nature and future role of Vocational Education and Training (VET) in Europe.